Explore the history of one of the world's most famous beer brands, as you tour this brewery-turned-museum in the heart of Amsterdam. 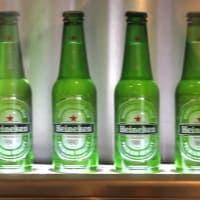 This self-guided tour takes you around the original Heineken brewery, which dates back to 1867 and has now been converted into a unique interactive visitor experience. You'll learn about the history of Heineken, the ingredients behind it and the brewing process, before topping it off with a taste of 2 fresh beers. Nothing amazing, best part was the bar at the end. Our booking had been taken by another group so delayed our entry due to extra checks. Tour was great, however, someone had gone in on our booking so took some working out when we arrived. These things happen though. Good experience. Again some slight confusion over tickets at the door but got this sorted quickly. The entire tour was massively overcrowded and felt like one gigantic queue. Good tour plenty of drink supplied . This beer giant’s former brewery with tasting room has been transformed into a sensational interactive tour through the history and world of Heineken. Located just a 5-minute stroll from Vondelpark, it’s close to Centrum and can be accessed by the line 16 or 24 tram from the central station.